Even since iOS 11 editing in Appigo’s Todo Cloud.app has been buggy for me on iPad and iPhone alike. Just aggravating. Feels like they failed to revamp something. I wasn’t delighted with their sync technology, but I could live with that. The editing bugs finally broke me. So I decided to exit. 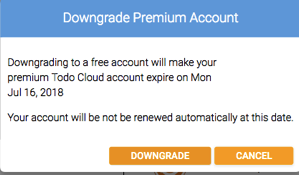 Somehow I remembered Todo Cloud is a subscription service. I found my way to the somewhat hidden account settings and disabled premium. Turns out that turns off auto-renewal. Appigo is a textbook example of how subscription solutions can disappoint. They never provided a good export strategy, so there’s a strong data lock. Then they failed to do minimal maintenance but continued to collect subscription revenue and sell the app. Had good data export (exit strategy). I evaluated Things.app and OmniFocus. Things got #1 and 3. OmniFocus got #1 and 4. Neither got #2. On the other hand, Reminders.app for iOS got #2 and #3 and it’s free. So it’s weirdly in contention. For now I’m using Reminders.app for tasks and Trello for projects. I manually copying over tasks that had dates, it’s not too bad. The backlog of ‘someday’ tasks I’ll gradually slog away at. If Things gets some data export I’ll probably buy it, but it’s expensive since it’s not a universal app. If OmniFocus gets family sharing I might buy it. Meanwhile I’ll see what I can make Reminders do. I think this is my first significant iOS functional regression. Seven years later and ToDo.app is moribund (I’ve been using it for 10 years!) and both OmniFocus and Things are still flawed. Since I first wrote this I’ve run into issues with Reminders.app — including sync bugs and even text editor bugs. On the other hand, OmniFocus is promising a web client. I’m going to transiently switch back to ToDo.app and see if WWDC providers some kind of family sharing for subscriptions. That would make OmniFocus pricing less extreme.